We spent the first night of our week long cruise with Mediterranean Delights Fitness Voyage anchored off the coast of Rhodes. 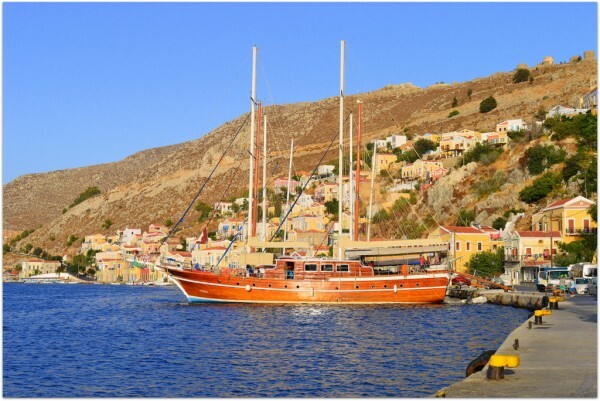 The gentle rocking of the gulet resulted in a peaceful and refreshing night’s sleep despite the early morning wake-up call of the engines roaring into action. 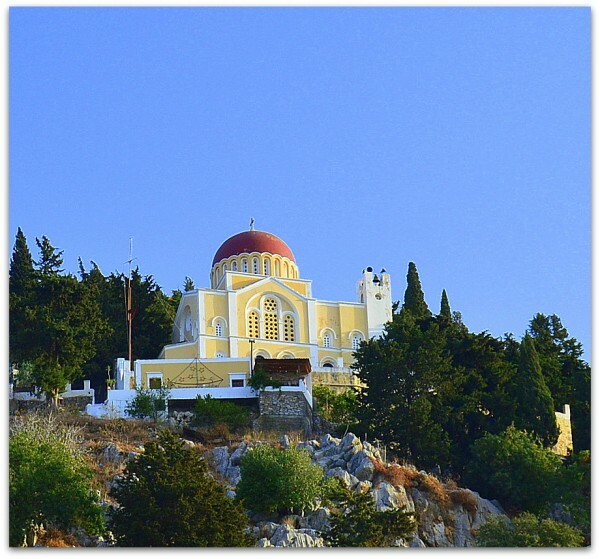 We were setting off to the island of Symi which sits approximately midway between Rhodes and Datça, a town on the coast of Turkey that we would be visiting the following morning. 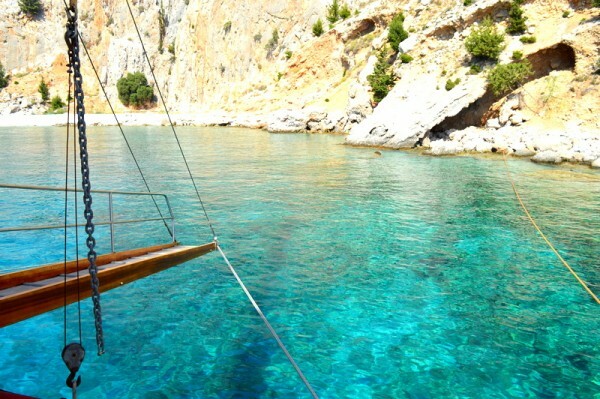 Before making our way to Symi harbour where we would be anchoring overnight, a morning stop had been scheduled in one of the island’s many beautiful coves. 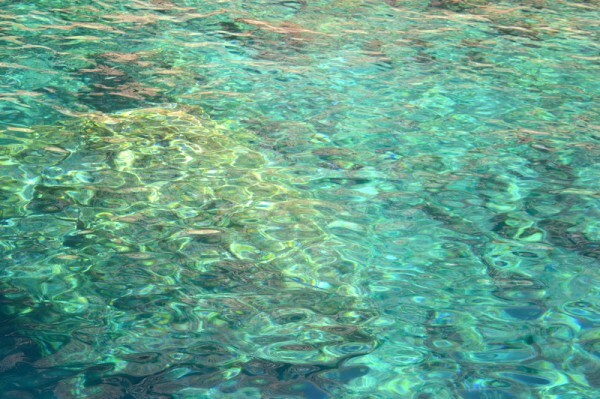 With the famous Rhodes wind no longer present, the sea was calmer to swim in than it had been the previous evening. The sea had changed from a deep, cool blue to an almost-transparent azure green so clear you could see all the way to the bottom. The water shone like a jewel, the sunlight transforming its colours through an array of shades, glistening and glinting wherever the light hit and gradually deepening as it moved away from the coastline. We saw a small mountain goat while some time away on the shore. How it appeared there was a mystery to us, it seemingly coming from nowhere. 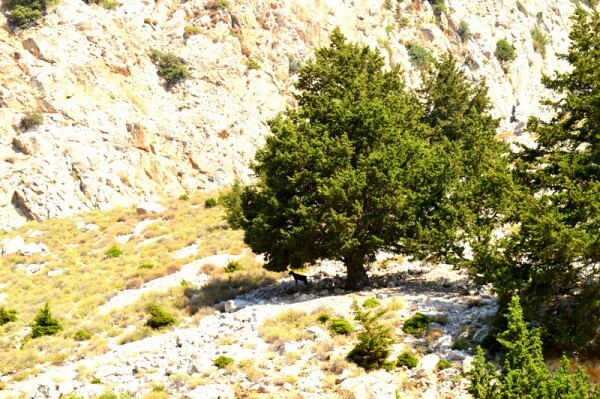 We then watched it closely as it made its journey along the steep mountain sides, returning back to its mother who waited for her kid beneath the shade of a tree. 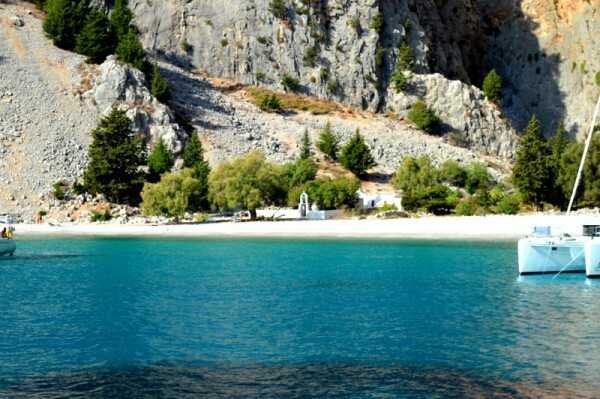 The cove was small but seemed popular with several other gulets joining us in anchoring off the shore. 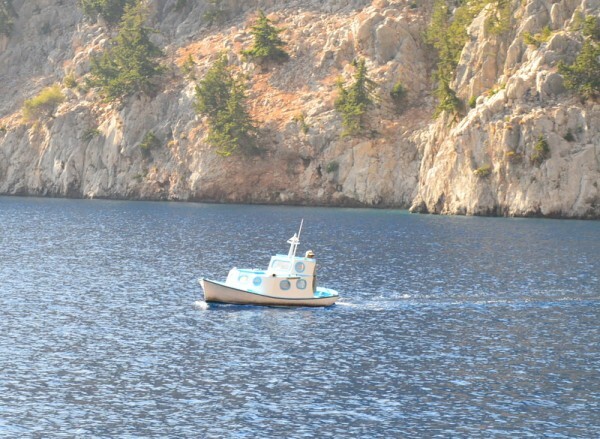 Small fishing boats would occasionally appear from around the rocks, making their way past like a toy vessel in a bathtub. A small chapel sat on the rocky shore of the cove. The swim over is stunning but the pebbles and rocks are not for the faint-hearted or the bare-footed! 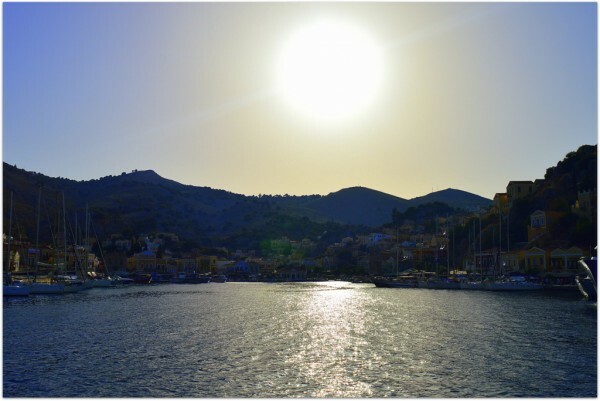 After spending the morning savouring the warm waters, the idyllic views and the splendidly warm sunshine it was time to take a short journey around to the harbour. 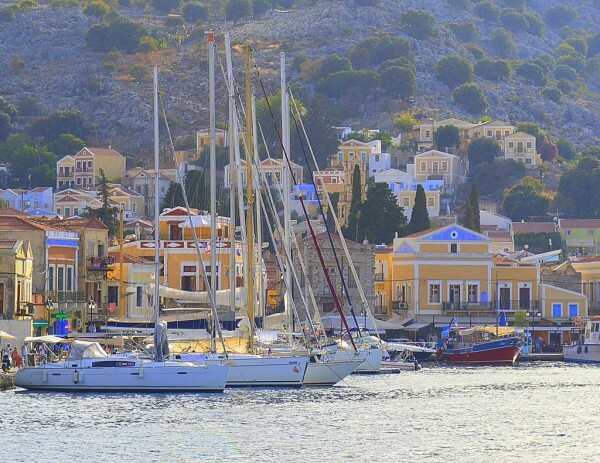 The harbour of Gialos is Symi’s largest, helping to support the islands biggest trade of tourism upon which it is almost entirely reliant. 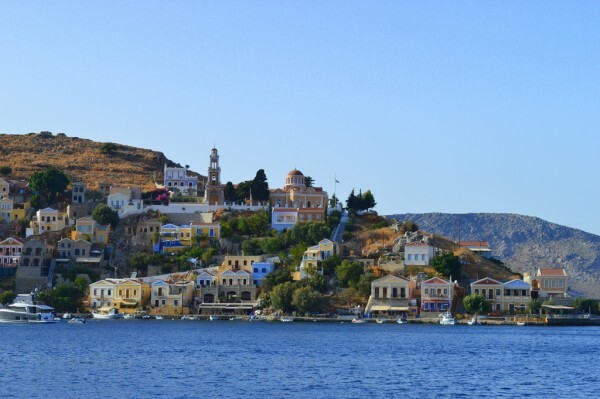 As with many of the islands and towns, there doesn’t seem to be any one correct spelling either for Symi itself (Simi), or for the port of Gialos (Yalos/Yialos). 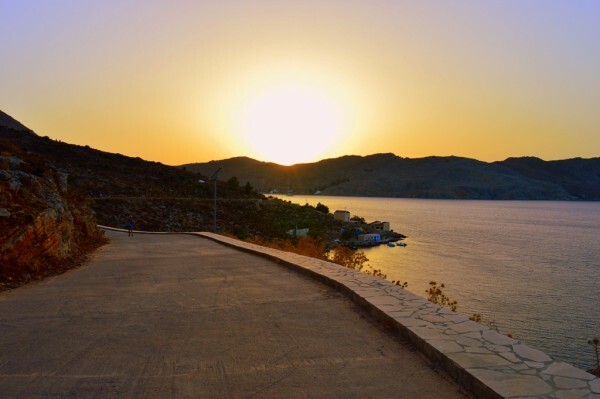 Gialos, situated on the lower part of the island along with Chorio at the upper part, provides visitors sailing in with a picture perfect welcome to the island. 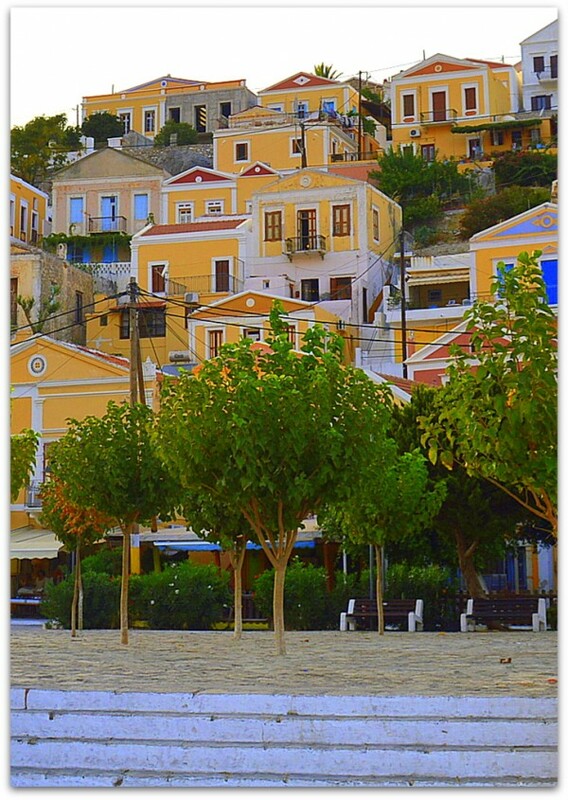 The neoclassical houses sit in staggered rows within the steep terrain of Symi’s mountain sides. Few people can resist the superb photo opportunity provided by these views. 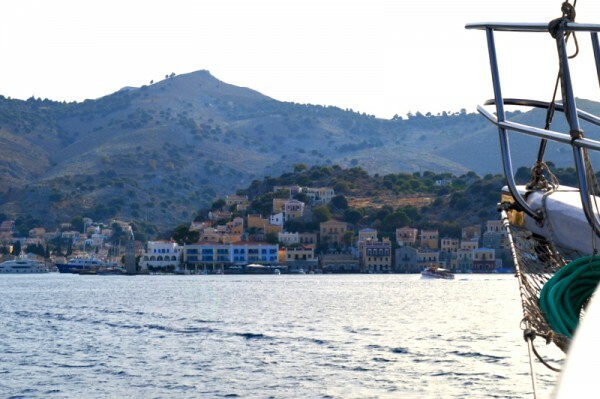 The island was once one of the most prosperous within the Dodecanese thanks to the shipbuilding industry and its abundance of natural sponges. 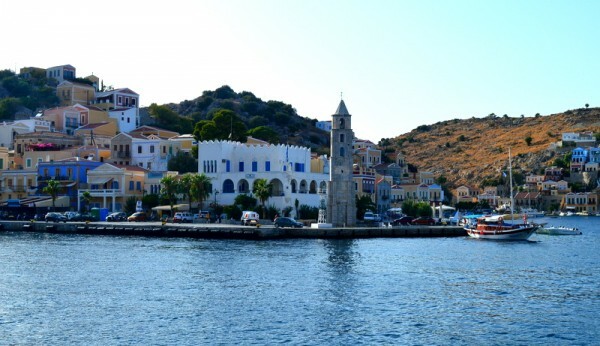 With the decline of shipbuilding due to the lack of wood from trees and the tragic loss of sponges killed off by disease, the island has seen its economy worsen considerably. 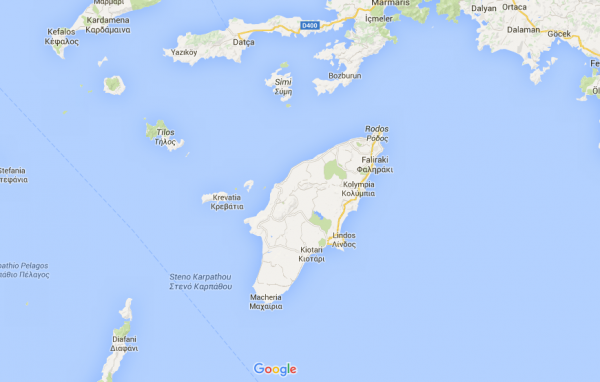 Many of the island’s inhabitants moved away to escape the economic hardship the island faced. The population of Symi has seen it drop from over 22,000 in 1912 to little over 2,500 people just over a hundred years later. 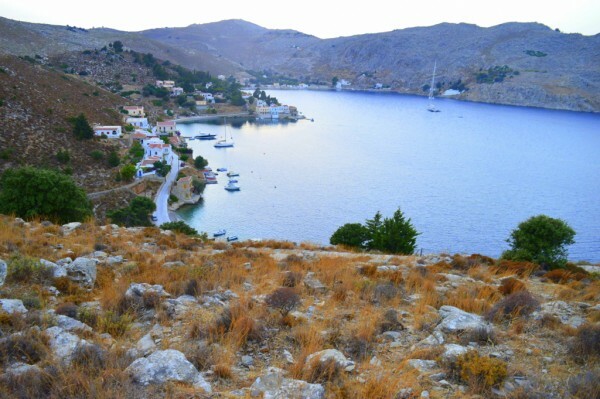 Of those remaining, 99% of them live within ‘Symi Town’, this area which is actually comprised of the villages Gialos and Chorio, and a third village of Pedi which lies much further along the island. 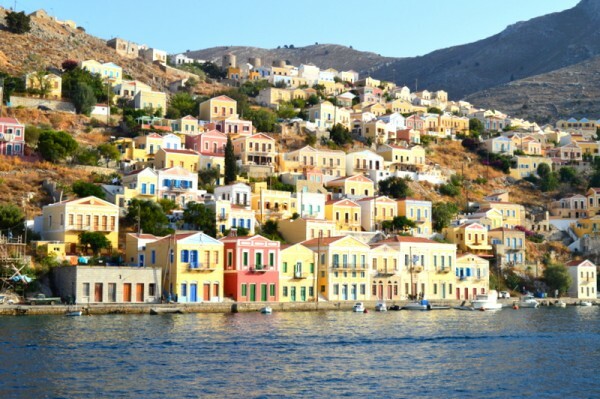 If the Greeks know how to do something well, it’s tourism and Symi is no exception. However, tourism was developed over the years following a last-ditch attempt to save the island back in the 1960s. 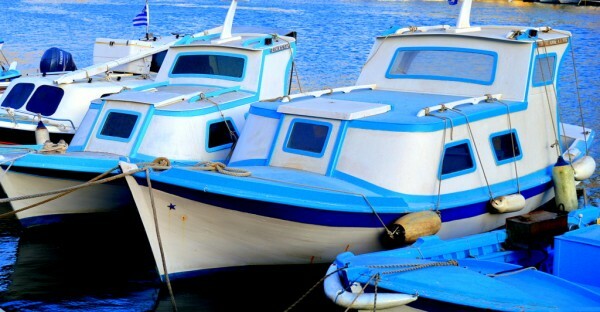 The attempt paid off and the locals manage to maintain the traditional feel of the island despite the number of visitors which sail into its harbour every day, many of whom arrive for a day trip from nearby Rhodes. 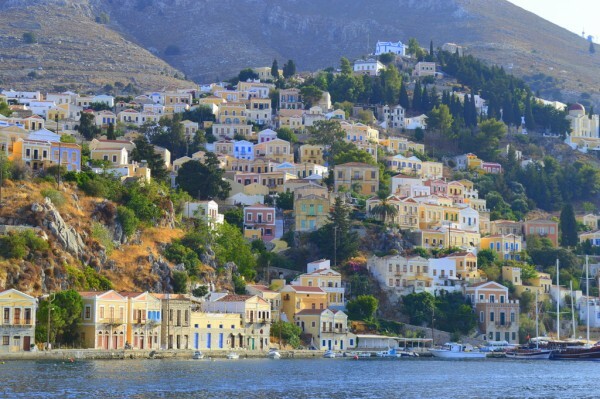 An annual rainfall average of only 42 days a year leaves Symi extremely dry and waterless and the temperatures are considered hot even by Greek standards! 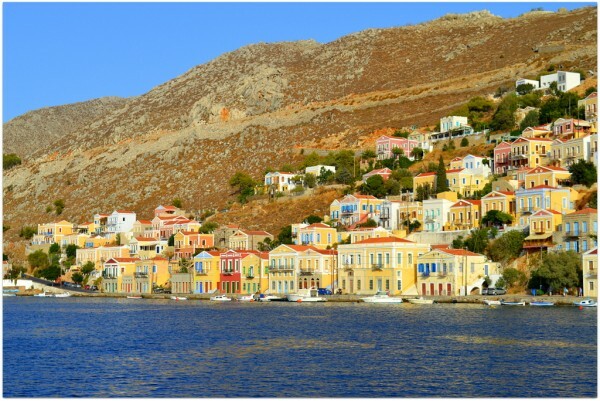 Symi town is officially a Greek National Conservation Area. Whilst there are many beautiful examples of neoclassical buildings around the harbour, many other buildings still bear the signs of destruction by German occupiers of 1944 who, before their departure from the island, exploded any munitions they still had before they vacated. During high season the influx of tourists sees the island’s population almost double and it is estimated that there are more than 1000 beds available for visitors. 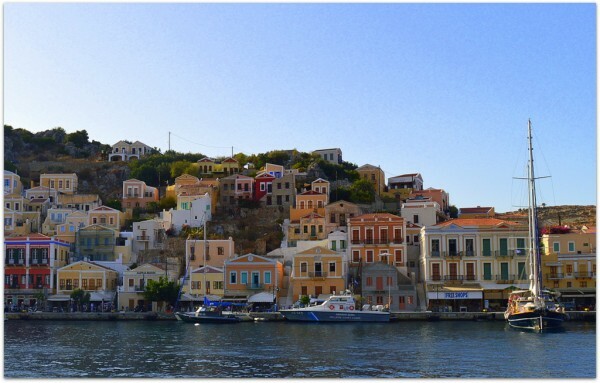 Symi’s dependence on tourism is unquestionable; without tourism the islands population would undoubtedly have declined even further, perhaps even completely. 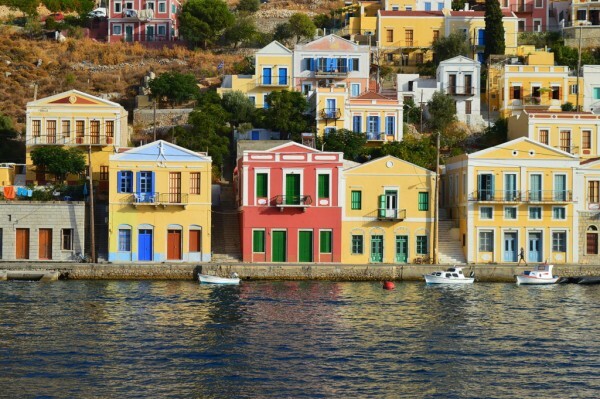 While only small and with no obvious attractions or architectural gems to seek out as such, Symi has a high rate of return visitors and it’s easy to see why. Its size leaves it with a relatively cosy, traditional feel that remains unspoilt even with the number of incomers to the island. 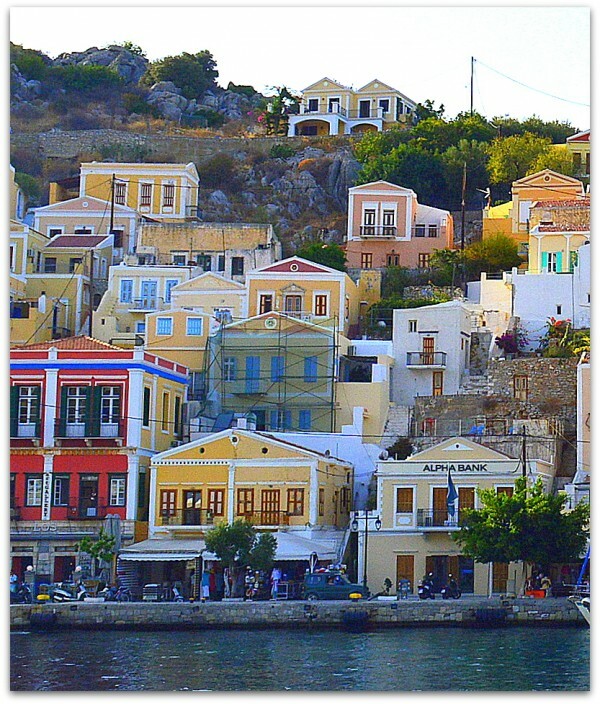 Granted, if it were not for them, Symi would be almost entirely uninhabited. 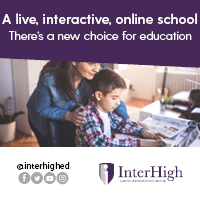 It is a partnership that works to the benefit of both. The majority of the tavernas and clubs sit around the harbour but despite this, sleeping on deck was not an issue at all according to my fellow travellers who chose to camp out under the stars. Noise and disruption was minimal leaving them to enjoy a peaceful slumber beneath the clear blanket of the night sky. Exploring the island was a must with artwork and creativity appearing all over. 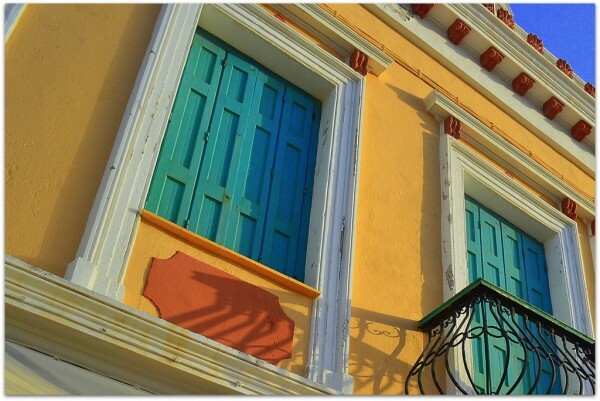 Splashes of colour where everywhere, the greens, yellows and oranges standing out against the bright blue sky. The opportunity to appreciate the wonderful neoclassical architecture was not to be missed. Steep stairways set between the houses led to the upper range of terraces wedged into the sides of the mountain. The tiny fishing boats like the one we had seen earlier during the day were lined up along the harbour, bobbing to the tune of the gentle tide. 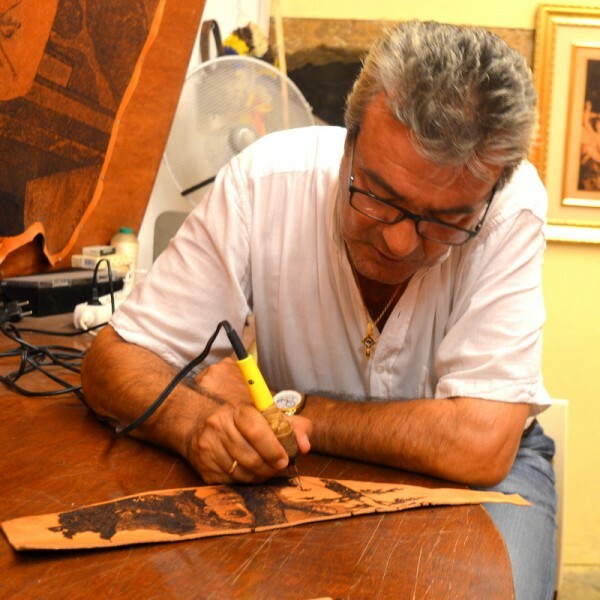 Takis, a leather designer and producer whose successful business is one of the island’s main attractions expressed his sadness at Symi’s decline. ‘We don’t have a hospital. If you get sick here, it’s not good,’ he told us. ‘What happens if you need help?’ I asked him. Takis owns a leatherwork store that runs alongside the harbour. A designer and producer of shoes, bags, wallets and more, his work is renowned. The craftmanship is superb. The hospitality is second to none. The combination proves popular for everyone who visits the island – even from as far as Hollywood. When you visit his store you are welcomed like a long lost friend and it was as we stood admiring the wide selection of products on display that we were invited to see some examples of his work of a different nature. He led us to another part of the building immediately next to the main store where a small desk sat in front of a fan. 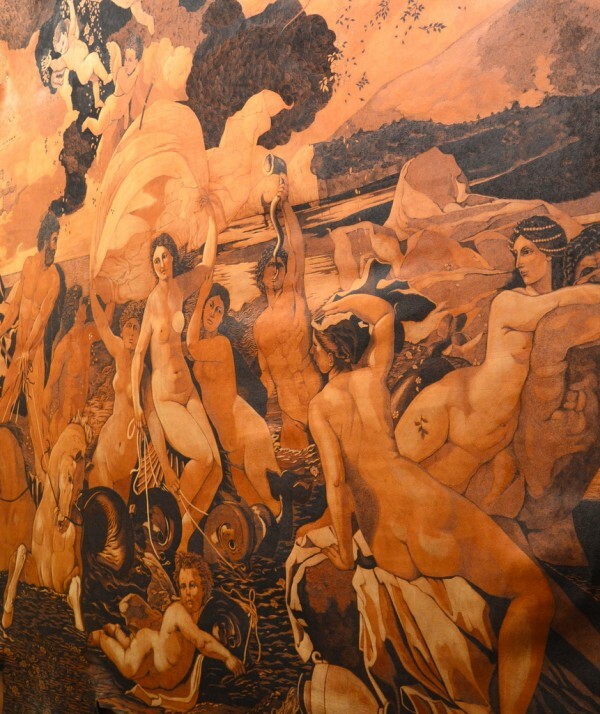 On every surrounding wall hung the most incredible works of art. 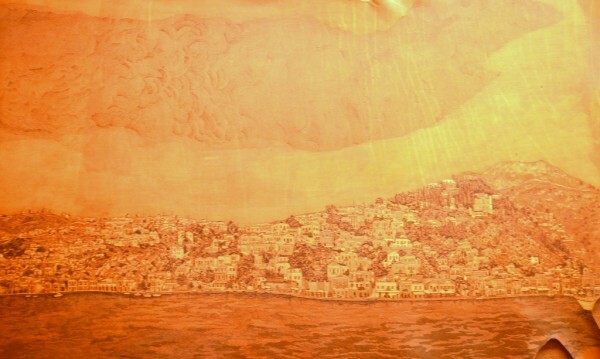 Takis created this leatherwork of Symi harbour. The photo truly doesn’t do it credit. This photo provides a better idea of the size and detail within this particular piece. Amazing, isn’t it? 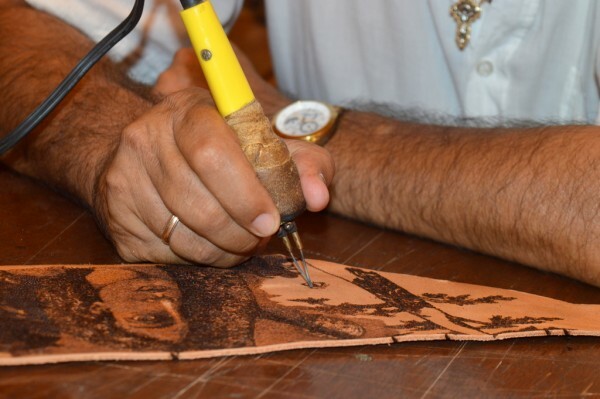 Takis uses a technique called pyrography, a method of decorating wood or leather by burning it with a heated metallic point. 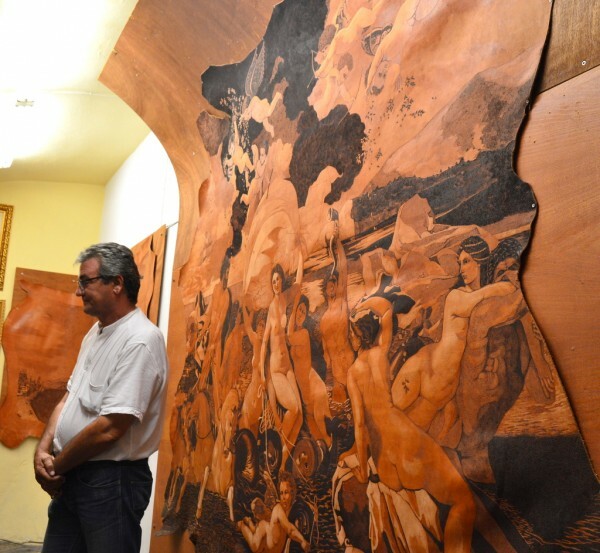 Takis told us how his artistic gift became apparent when he was only five-years-old. As a child he sat and began to draw one day and the most amazing picture appeared. Everyone then realised he had something special but his own take on his skills was rather more pragmatic. ‘It’s a gift and a curse,’ he said sincerely. It was quite an experience to be able to watch such a talented craftsman and artist at work. 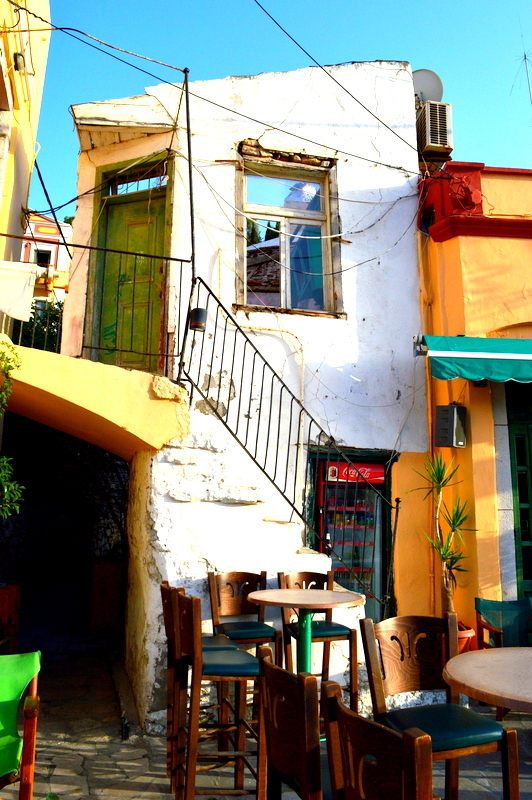 If you ever visit Symi do make sure you stop by his shop and say hello. I guarantee that you will be welcomed. Time on the island was pressing and the evening was closing in. We walked by the war memorial which was set a little way back from the path, part of it sitting within the rock face itself. 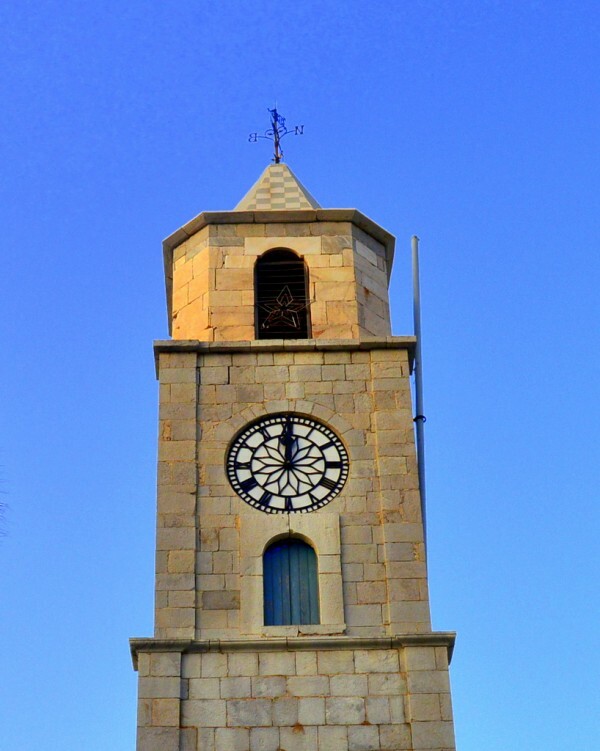 The Roloi clock tower that sits at the end of the entrance to the harbour was built back in 1881 by the son of P. Petridis – the word roloi meaning clock in Greek. 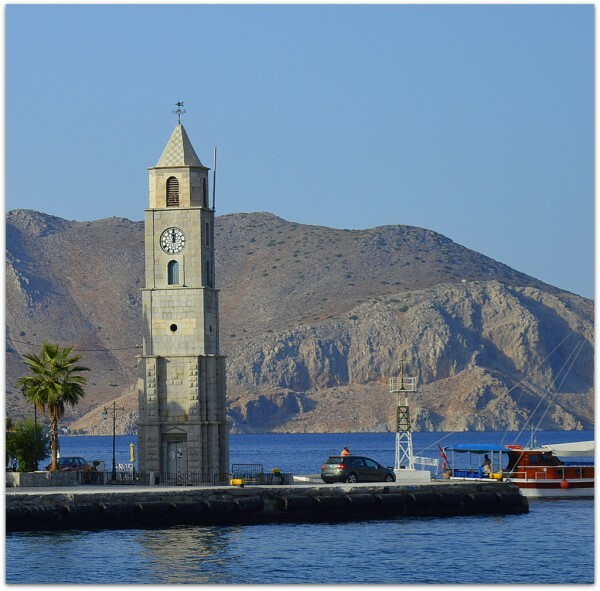 A little statue stands in front of the Roloi, a fisherman named Michalaki, who greets the boats and yachts as they come into the harbour and bids them farewell when they leave. 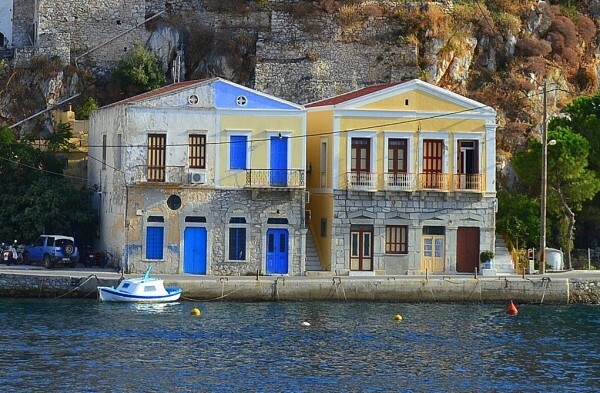 A nearby nautical museum contains old maps, model ships and other maritime artefacts from Symi’s history. The nearby Roloi Bar provides visitors with internet access and cooling beverages to help ward off the heat. With no dedicated tourist office on the island you will be reassured to know that the locals are usually more than happy to help out if you are lost or just need advice on where to go and what to do. A hike to the top of the island is not for the weak-willed and is definitely something to attempt during the cooler part of the day. A hike during the high heat of day is certainly not recommended. If you’re still determined make sure you take a cool drink along with you and, if at all possible, wait until the evening is drawing to a close. The sunset view will be worth it! 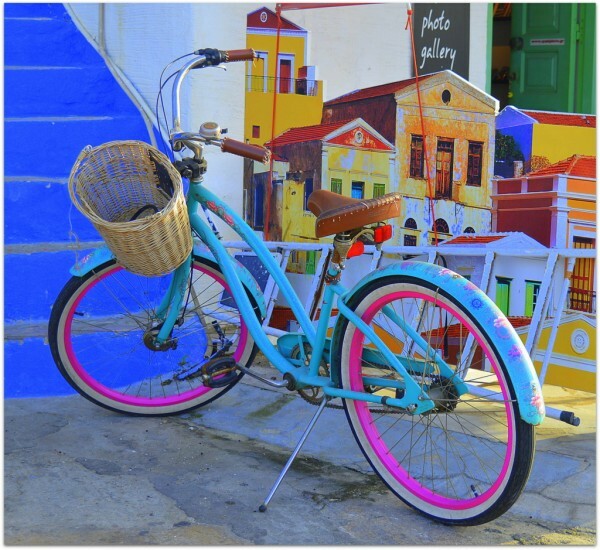 *I was invited to travel with Mediterranean Delights Fitness Voyage in order to write about my experience. All opinions within these reviews are my own and readers are advised to do their own research. We’ve been sharing some of our top packing tips for travelling with the family over on the blog at Oliver’s Travels. What would you add? He is extremely talented – and what a fabulous range of bags and shoes his store sells too! 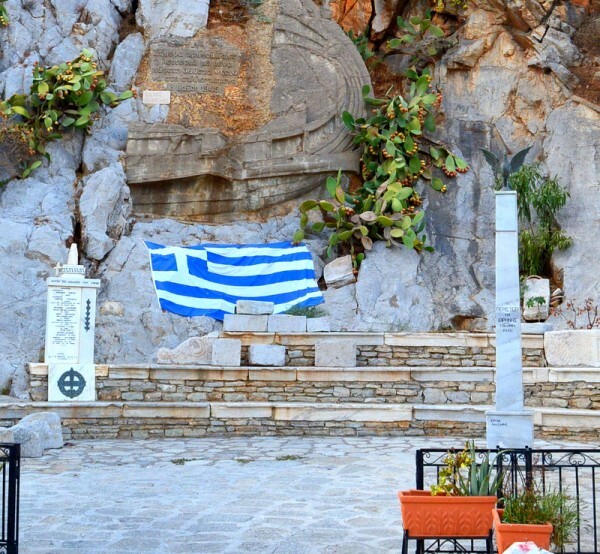 Το πιο ωραιο νησί !! It really is a very beautiful island. If you ever have the chance to go, take it.